Nicholas James watches a putt as it heads toward the hole. Elijah McCarty tries to chip in a golf ball from the edge of the fairway. Molly Fitzwater tries to chip in a ball from the fringe. MCDERMOTT — A highly competitive tournament with local talent abound across the board. It’s a dream for any person looking to promote a sport from a local standpoint. 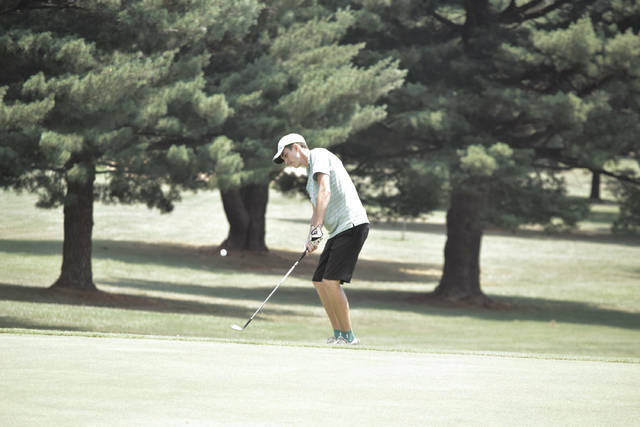 On Monday afternoon, the Tri-State Junior Golf Tour showcased such a tourney when the TSJGT made its second of six stops in 2018 at the Elks Country Club in McDermott — a course that finished renovations in the summer of 2017 and provided much of the same great action that it has been lauded for since the installation of $37,000 worth of bermuda grass last summer. 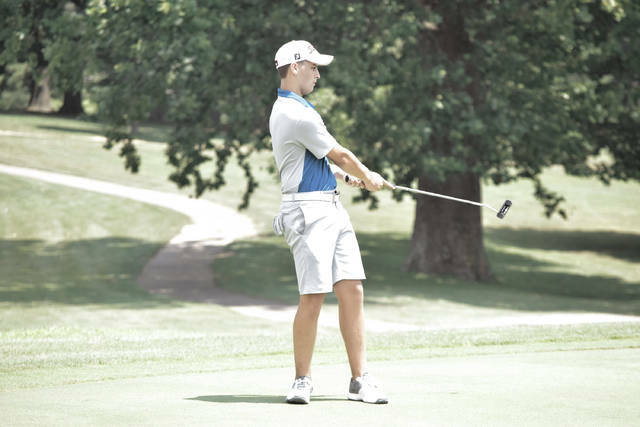 And that, along with the competitive play across all flights from the 40 golfers in attendance — in temperatures that exceeded 90 degrees for the fifth day in a row, no less — had Jason VanDeusen pleased with the overall results. Well-known for their golf prowess on courses across the area, Trevon Mault and Cameron Phillips each took home first-place medals in their respective age brackets, while Owen Mault obtained a second place showing to finish two strokes behind Phillips in the boys 10-12 age bracket. Trevon, who competed in Flight I of the 13-15 age bracket, easily took home top honors in the flight by shooting a splendid 78, including 39s on the front and back nine. His score not only was the best in the flight by 19 strokes, but the best in the entire 13-15 age bracket overall as the elder Mault was the only player to record a stroke of under 80 and one of only two players to record a stroke of under 90 in the age bracket due in large part to recording a stroke of three on the ninth, 12th, 13th, and 17th holes. Phillips and the younger Mault, who also finished one-two in their age bracket (Mault 33, Phillips 35) at Riviera Golf Course in Lesage, W. Va., switched places on Monday as Phillips’ 36 bested Mault’s 38. Both players were tied entering the final hole in the nine-hole flight, but Phillips’ birdie bested Mault, who bogeyed the final hole. Fellow local hand Tanner Stevenson, who competed in Flight II of the 16-18 age bracket, had his own impressive moments as his stroke of four on the sixth and 17th holes were the best among his fellow competitors, while his five on the 10th and four on the 15th tied for the best mark on those particular greens. The Wheelersburg hand battled through the heat to collect a 100. The Elks, once again, provided the competitive play that was also desired as well as the NorthBridge and Latitude 36 bermudagrass that was installed last June — which ultimately spanned 14 acres upon completion — led to strong action at the front of the flights. In all, every flight with the exception of two (six of eight) saw the first and second place finisher come within five strokes or less of each other. Mault, Nicholas James, and Elijah McCarty all finished with 18-hole scores under 80 while Molly Fitzwater and Deanna Caraway finished with scores under 100 on the girls side of the coin over an 18-hole stretch. 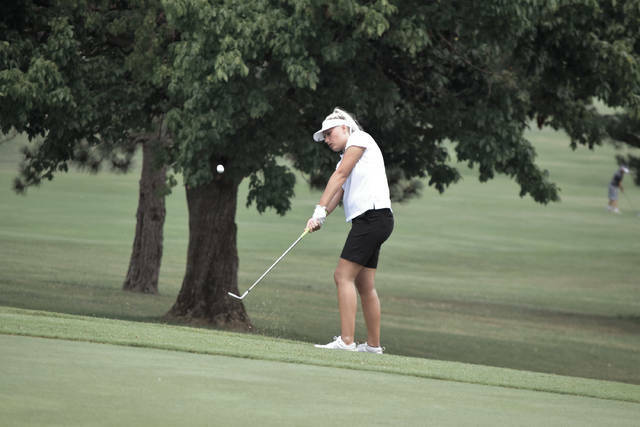 With the tournament at its end, the Tri-State Junior Golf Tour will head to the Sugarwood Golf Course, which is located in Lavalette, W. Va. on June 25. The TSJGT will take a week off before coming back to Scioto County with an appearance at the Shawnee Golf Course on Monday, July 9.
https://www.portsmouth-dailytimes.com/wp-content/uploads/sites/28/2018/06/web1_DSC_0529JPG_cmyk.jpgNicholas James watches a putt as it heads toward the hole. https://www.portsmouth-dailytimes.com/wp-content/uploads/sites/28/2018/06/web1_rsz_dsc_0528_cmyk.jpgElijah McCarty tries to chip in a golf ball from the edge of the fairway. https://www.portsmouth-dailytimes.com/wp-content/uploads/sites/28/2018/06/web1_DSC_0542JPG_cmyk-3.jpgMolly Fitzwater tries to chip in a ball from the fringe.